Diana Rigg's first Avenger's appearance was in The Town Of No Return. This episode opens with neither Patrick MacNee or Diana on camera. It is only after the introduction to the story that she is first seen. And even at that she is practicing fencing and wearing a face guard. A second or two passes before she pulls it off, revealing her face. Does anyone remember the publicity leading up to The Avengers in 1965? Had they kept Diana's face under wraps to build up interest in the new season? I'm reminded of the first James Bond movie after Sean Connery left the series. Mr. Lazenby's face wasn't revealed until several minutes into the next movie, co-starring coincidentally, Diana Rigg. Or did they simply showcase Diana as the replacement for Honor Blackman, who had left The Avengers, coincidentally, to star with Sean Connery in Goldfinger? actually, Diana replaced another actress who was peel..
You're right, the first episode broadcast (London area) was The Town Of No Return, but it was actually filmed about half a year later than the first-produced one : The Murder Market. I particularly like Diana Rigg's first-produced ones. I don't think there was a UK trailer for Emma Peel taking over from Cathy Gale (as there was when Linda Thorson took over from her), but there was a lot of press coverage. The 'Chessboard' intro for the USA, must have been used as a trailer there too. I've always thought it was a deliberate delay in revealing the new Avengers girl. keeping the audience in suspense those extra few seconds. You're right, the first episode broadcast (London area) was The Town Of No Return, but it was actually filmed about half a year later than the first-produced one : The Murder Market. The first episode to go before the cameras wholly with Diana Rigg as Emma Peel was The Master Minds, the filming of which commenced on Thursday 17th December 1965. The interesting thing, looking at these production dates, is that clearly the producers took some while in deciding that Shepherd was wrong for the series - about six weeks and a day! That was a seriously quick turnaround on The Murder Market between Shepherd going and Rigg refilming. It is of course possible that the scenes filmed in the last few days of the first block didn't feature Emma Peel, but even then, still a quick turnaround. with regard to Diana's debut, there is the ITN interview, in which she & Patrick Macnee appear. She talks about taking on the role. On youtube, the uploader of a brief clip of the interview, has stated that it was broadcast in December 1964. If this is correct, then it was just after she gained the role, and many months before her actual TV debut in October 1965. As there were only 3 TV channels in UK at that time (BBC2 having just started, to join BBC 1 and ITV) I would think it was watched by a large portion of the population-those with TV sets, of course!! Publicity in newspapers is usually accompanied by a picture, but not always. But, even with George Lazenby, there was a pre-publicity shot of him in Bond suit, holding a gun, and leaning against a lamp-post. This shot has since been used as a DVD/blu-ray cover. 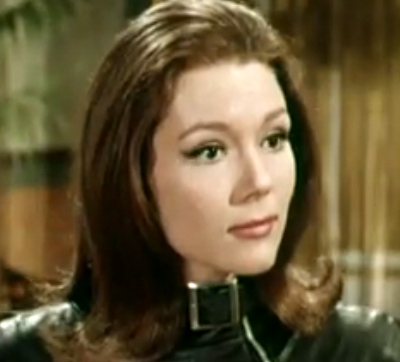 I don't think that there was any effort at all to hide Diana Rigg's casting as Emma Peel. Media interest was so great that ITN conducted a short interview with Rigg (with Macnee in attendance) at Elstree Studios on Monday December 14th 1966, which also mentioned her background as a Shakespearian actress. On the same day she also posed for a number of publicity photographs wearing a black turtle neck sweater and matching trousers, holding a 9mm Walther P38 automatic.